That’s what commonly heard for the past 2 weeks as she was sick. Daddy feed. Daddy bathe. Daddy change. Then, she was crying, grumbling while sleeping on Monday morning. That’s very early in the morning. Only about 7am. So, who make the milk? Mummy! It’s either mummy or daddy. The maid can’t even touch the towel. If the maid help to take anything, she just got to put it back at the same place, then mummy go get it for Elizabeth again. Fussy! Terribly fussy! So end up it’s the maid who manage to get a good rest. And, mummy and daddy can’t even get a good night sleep for almost 1 week already. Yesterday, Elizabeth was playing at the playground in Gurney Plaza again. Mummy has yet to show you how much she loves that playground. However, mummy just can’t wait to show you how much daddy has sacrifies for his girl. I can see that daddy really made a great effort to spend time with his girl. We love you, daddy! Last Saturday, mummy, daddy and Elizabeth were praying at The Goddess of Mercy Temple ( Kuan Yin Teng) Penang. This is one of the most famous historical buildings in Penang. And, mummy seems never brought her there. This should be the first time little Elizabeth visited this highly auspicious temple. As she already learn how to pray with both palms close together — “Pai Pai”, she will “Pai Pai” whenever she was asked to do so. Good girl! May God bless you! Mummy likes the idea of daddy that take the initiative to free the birds together with little Lizzy. Buddhism believes “Thou shall not kill”, and it’s good karma to free the animals instead of killing them. 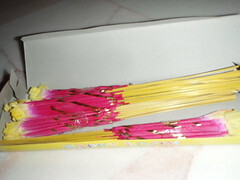 Thus, there is a stall outside the “Kuan Yin Teng” selling birds in the cage to promote this idea. can even picked up the phone every now and then and start talking for so long. Mummy still can’t understand her language yet. But, mummy can hear she called “Papa”. 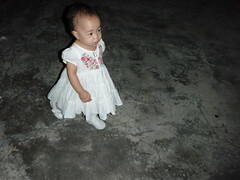 Elizabeth also keep asking mummy to carry her outside. And, if she does not see daddy’s car, her face will immediately turned grumpy. Then, she will point to the place where daddy always park the car there. And, twist and turn her hands to signal “No”. Poor, girl! Daddy is coming home, k? 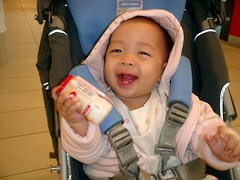 Daddy seems want to bring my little princess to Kuala Lumpur. Frankly, mummy have no confidence at all on making sure baby Elizabeth will not cry when she has to be in the car for more than 4 hours. However, mummy is kind of excited. Mummy plan to bring the maid along to help along. That sounds much better, isn’t it? There are so many things I need to get prepared, including which are the places should we visit when we are there. Zoo? Which toy or what book to bring along? What are the food that I should prepare for Elizabeth? Bread? Biscuits? Plain Rice? Fish balls? Should I get a new luggage specially for baby Elizabeth too? I should bring more pants and shirts for Elizabeth, or more dresses? Somehow, this is not the final decision. Mummy might decide to give up this idea. As mummy is thinking of reserving this trip as the romantic moment for 2. Oh! I am still very uncertain. Of course I know she can’t talk yet. But, mummy knows her well. As usual she will look into the study room whenever she miss her daddy. This is because daddy is always in the study room whenever he is at home. However, it’s kind of strange that she just never did for these 2 days. It’s quite impossible that this little girl just forget about daddy all of the sudden. I suspect that may be she really understand what mummy and daddy told her. Yeah… other than Balloon, I like flowers the most! Anyway, this is my Valentine’s present from Daddy. But, mummy said it’s hers! So bad! It’s mine! 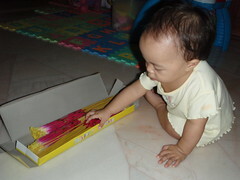 hahaha… Mummy supposed to blog about this yesterday. But, mummy actually cut her finger yesterday. Thus, don’t feel like continue blogging after that. 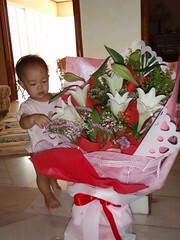 Somehow, I think if Elizabeth asked for flowers, daddy might easily buy a much much bigger one for her. Mummy knows exactly how much her dad pampered her! LOL! My girl did enjoy attending the wedding dinner. She will join the crowd and clap her hands together whenever she saw people clap their hands. However, daddy had a hard time that night. Elizabeth wanted to drink from the cup, but she still can’t handle it well. Thus, the drink in her mouth will spill out. So, mummy has to stop her to avoid her white dress get stained. Of course she cried. As a result, daddy has to carry her away from the table and walk her around to stop her tears. 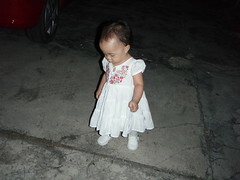 Anyway, I think Elizabeth enjoyed the most when she get a chance to run about outside the restaurant once the dinner end. It seems she was very friendly and quite independent. She can go near other kids on her own. In fact, she was the one who started running, bubbling and playing on her own. Then, all the “jie jie”, “ko ko” joined her. LOL! Not bad aye? At least she can take the lead! hahaha……. But, please don’t run so fast, my dear… mummy just can’t take it anymore! Er… you want to join me? I just can wait to see will my girl enjoy Chinese New Year? I always feel it’s a part of my responsibility to show and teach her about our Chinese cultures. And, what’s better than she can personally experience it on her own? This coming Chinese New Year will be her first time to expose to the various types of “kuih” (biscuits and cakes) that specially made for CNY, “angpau” and dragon dance. At the same time, She will learn that we actually visits our friends and family members during CNY to celebrate this big celebration together. That’s the reason why mummy do not plan for any Outer Banks vacation during CNY. Guess who is the one who brought this home? Of course it’s daddy! As you can see may be this is the reason why my girl is so boylish. Ha! Most of the time. she is like daughter like son to her daddy. Of course, we will burn it and she can only watch it. This is not something she can handle on her own yet. But, I am concern will it cause serious pollution to our home? LOL! Why should I think so much. This is just a one year once occasion.